Gov. Bill Walker and the two candidates who are running to unseat him pitched their ideas Tuesday on how to promote the state’s tourism industry. 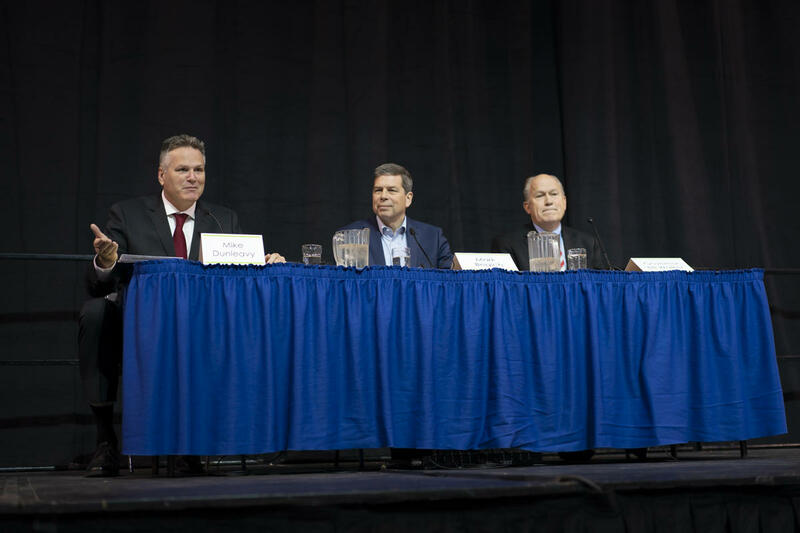 Walker and former Republican state Sen. Mike Dunleavy, along with former Democratic U.S. Sen. Mark Begich, talked about tourism and other issues during an Alaska Tourism Industry Association candidate forum at the Carlson Center in Fairbanks. The incumbent and his two challengers found much to agree on during a candidates’ forum hosted by the organization that advocates for the state’s tourism industry. All three say the state should boost funding for infrastructure like highways, airports and marine ferry and cruise ship facilities to facilitate tourism. But they also clashed with Walker over his contention that he had to cut funding for the industry and make other tough decisions during the state’s economic downturn. As he has throughout the campaign, Walker defended his decisions to sharply cut the state budget over the past three years after oil prices plunged and Senate Republicans refused his proposals to adopt other sources of revenues. Walker, who politically identifies as an independent, says he wants to help the industry promote year-round tourism, especially for visitors from Asia. Begich says Alaska needs bold leadership to boost tourism. He cited his push to get the Dena’ina Civic and Convention Center built 10 years ago, when he was mayor of Anchorage. Dunleavy, a conservative Republican, is the front-runner in the three-way contest. He says he’d take a small-government approach for both the tourism industry and the state’s economy. The three candidates all pledged to work with federal authorities to increase access to national parks. Dunleavy says he’d also task the state Fish and Game Department to increase stocking fish in lakes and to develop policies that would ensure there’s enough wildlife for tourists to see. “What I want to make sure you know is that you’re going to have a governor who’s not going to do things to you, but help you actually grow your business as we move forward,” Dunleavy said. All three candidates also said they’d restore funding for the travel industry association’s marketing efforts that the Legislature had re-appropriated over the past few years. The funding, which comes from a tax on rental vehicles, fell from $16 million in FY2013 to $1.5 million last fiscal year, after Walker vetoed part of the appropriation. He’s recently pledged to boost funding to $12 million. Both challengers say they’d protect the tourism-marketing funding from future re-appropriations. Begich says the funding is essential, the recession notwithstanding, to enable the industry to grow. “Even in bad times, you have to invest,” Begich said. Begich says he also favors a two-year budget cycle, to give businesses in tourism and other industries more time to plan ahead.